2022withYou is a Community of Passion set up using FreeTimePays digital technology. 2022withYou provides individuals, communities and businesses with a social media platform and digital gateway so they can connect and help make the Commonwealth Games a great success. Here at 2022withYou, passions, ideas and proposals can be pulled together and worked on in the one collaborative space. People with Passion who join this Community are provided with unlimited access to a suite of engagement tools that have been developed by FreeTimePays. This is the place where they can promote themselves, their ideas and their work and take their passions to another level. Be a part of 2022, help make a difference, create and impact and promote your passion with us! 2022 will be a very special year for Birmingham, the UK and for Community. However, much has to be done ahead of the Games and the great people of Birmingham have a key role to play. 2022withYou is a collaborative space and digital gateway for people who are keen to play a role and help make the Commonwealth Games a great success. Take the full post for more. Before we go on to explain more about the collaborative digital space created at 2022withYou.net, let us first tell you what has been achieved by our Community of Passion at BirminghamWeAre. In 2015, BirminghamWeAre set up an account on twitter to keep the people of Birmingham updated on a new impact focused digital space and portal being built (at that time) by FreeTimePays for people who are passionate about making a difference and creating a positive impact. In just a couple of years, the reach of, and interest in, BirminghamWeAre has grown significantly. For example, over 0.7 million impressions is now typically achieved every month by BirminghamWeAre through social media. BirminghamWeAre.com was established as the first Community of Passion by FreeTimePays in 2017. BirminghamWeAre.com is a digital 'shout out' space for people to promote their passion and connect with people who share that passion. But most importantly BirminghamWeAre is a digital gateway through which passionate people can gain access to a suite of FreeTimePays engagement tools which they can use to create an impact and make that all important difference for themselves and others. FreeTimePays is all about positive social value and economic growth and achieving this by supporting the passions of individuals and community. Already attracting a following of 100,000. FreeTimePays connected Communities of Passion will continue to grow its reach by 100% every year. Birmingham is the first City to benefit from FreeTimePays digital technology. BirminghamWeAre has been totally behind Birmingham's bid for the games and the engagement channel has several 'Games' related features already running and provides access to a huge gallery of Birmingham related content (including stunning photography). However such is the commitment of BirminghamWeAre in helping to make the Games a great success for the City, we have gone one step further. 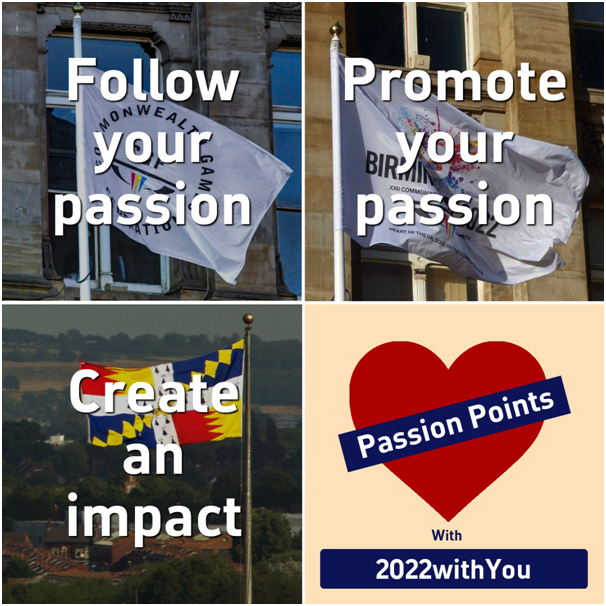 2022withYou as a domain has been registered to promote passion, support people with passion and give access to the FreeTimePays portal for collaborations and projects in support of a successful Commonwealth Games for Birmingham. 2022withYou will grow as a shared space for the many individuals, communities and businesses that will want to connect with the Games. Their work, their ideas and their proposals can be pulled together in the one collaborative space. In November 2018 we launch Passion Points, a FreeTimePays form of gamification that recognises and rewards people who get involved, help make a difference and collectively create impact. Contact Jonathan Bostock at jonathan.bostock@freetimepays.com or connect HERE with FreeTimePays for more information on sharing your passion for Birmingham and for the Commonwealth Games. 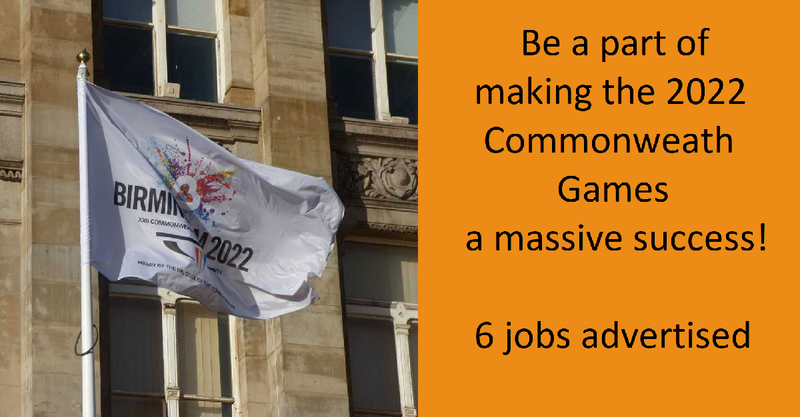 Help make the Commonwealth Games a great success for Birmingham - Join Us! 2022withYou is a FreeTimePays Community of Passion that utilises digital engagement and social media to deliver real change and positive social impact. ‘People with Passion’ are given the digital space and the digital tools so they can promote their passion for Birmingham and the Games and connect with people who share their passion. 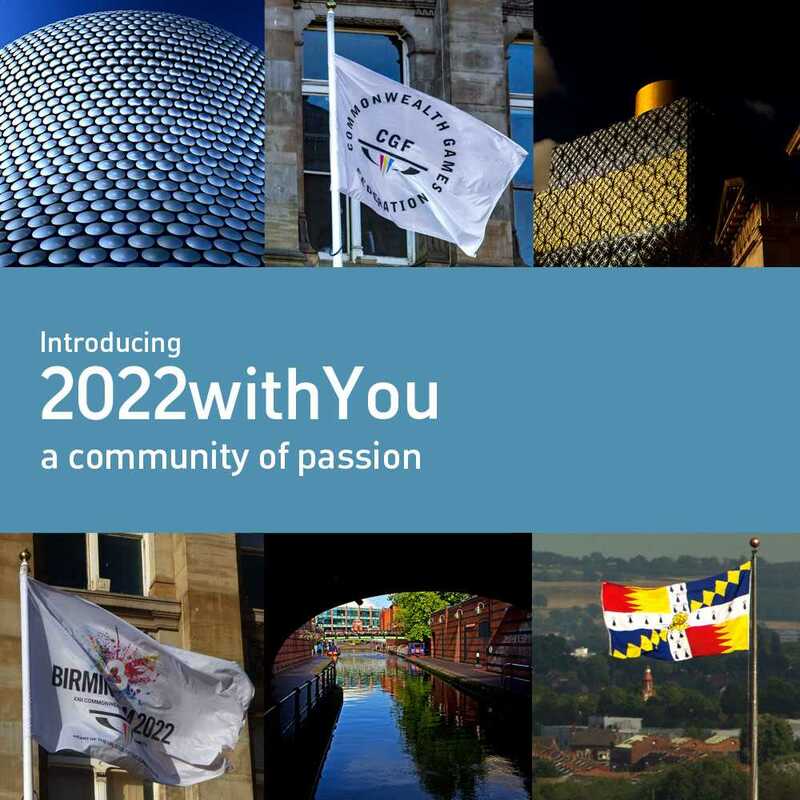 2022withYou is all about engaging people in the promotion of Birmingham and the Games and the recognition that the Games are there for us all to enjoy and for community to value and benefit from. 2022withYou is a Community of Passion that utilises FreeTimePays digital engagement and social media to support passion and deliver positive social and economic impact. FreeTimePays is an impact focused digital platform and social media channel specifically for people who want to make a difference. 11 Jan 2019 - Luke Harris Did you know? National Olympian Games held in Birmingham in 1867 - Did you Know? 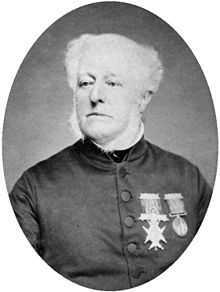 In June 1867, Birmingham hosted the National Olympian Games, an event partially organised by Dr William Penny Brookes of Much Wenlock, a figure who inspired Pierre de Coubertin to form the International Olympic Committee. It took place over three days and featured contests in sports including athletics, swimming and cricket. In the summer of 2022, Birmingham will be at the centre of the sporting world when it hosts the 22nd Commonwealth Games. For many, this represents England’s second city finally getting its chance to join those British cities who have recently hosted a multi-sport event. Following the disappointment of losing out to Barcelona in the bidding for the 1992 Olympic Games, and then being forced to watch on enviously as Manchester then Glasgow hosted the Commonwealth Games and London the Olympic Games, there was a belief that Birmingham might never get such an opportunity. Those making such a claim are perhaps unaware that Birmingham had previously hosted one of the pioneering Multi-Sport festivals; the 1867 National Olympian Games (NOA). The NOA are today accepted as one of the forefathers of the Modern Olympic Games. The Association was formed on 7 November 1865 at the Mechanics Institution, Manchester, by a group which amongst others included Dr William Penny Brookes. Brookes was throughout his life an advocate of physical exercise and founder of the Wenlock Olympian Association in 1850, was a friend and inspiration to Baron Pierre de Coubertin, founder of the International Olympic Committee (IOC). Brookes importance and role was acknowledged by the Frenchmen in 1890, when he wrote; ‘‘The fact that the Olympic Games, which Modern Greece has been unable to restore, are being revived today is due not to a Hellene (a Greek), but to Dr W P Brookes’. The NOA had many comparisons to the Much Wenlock Games, and were established ‘for the encouragement and reward of skill and strength in manly exercises, by the award of Medals or other Prizes, money excepted’. Professional athletes were to be ‘excluded’ and the desire was to encourage physical activity amongst the population, a legacy which the Olympic Games continued. Less than a year after its formation, the NOA’s first games took place at Crystal Palace in 1866, with events in athletics, boxing, fencing, gymnastics, swimming and wrestling. These Games were a considerable success, with over 10,000 spectators in attendance and more than 200 athletes competing. Following this success, a second Games were held in Birmingham between 25 and 27 June 1867. In the middle of the nineteenth century, Birmingham was a thriving industrial city, described by Edmund Burke as ‘the city of a thousand trades’. The accuracy of this statement is debatable, but there can be no doubt that it produced a wide diversity of products and provided 230 exhibitors at the 1851 Great Exhibition. The growth of the city ensured the founding of multiple sporting and leisure organisations, one of which was the Birmingham Athletic Club (BAC). Formed in 1866, one of the first major events the club organised were the 1867 NOA Games, held upon its grounds. "rejoiced that a National Association has been formed which, by diffusing useful information on this subject, and by the encouragement it will give to practice and competition in gymnastic and athletic exercises, will confer a great benefit on the country." "You have set a noble example, which I hope will be followed by all the large towns of the surrounding midland counties. I trust that henceforth men shows will become as popular as cattle shows, and that a great interest will be taken in the physical development of a human being as in that of a horse, a cow, a sheep, or a pig. I trust that, ere long, you will have a gymnasium that will rival those of London and Liverpool-a building worthy of its great object, viz, the bodily training of the nobles of God’s creatures upon earth; a building, handsome and appropriate in its design spacious in its accommodation, convenient in its internal arrangements a building, too, erected not by shares, but by donations. I trust, too, that it will be well supported by all classes in this neighbourhood, since all classes will benefit by it, directly or indirectly." Much can be made of such a comment by Brookes, a figure who throughout his life desired to advance physical exercise and was concerned with the impact Industrial life was having upon the general population. Birmingham, through its industrialisation was certainly the type of place that Brookes was concerned about and potentially might explain why Birmingham was chosen as the location for the Games. Following the parade and Brookes speech, the first events were in athletics, with contests for boys in the Under 14 and Under 17 Categories. The majority of winners were listed as coming from primarily ‘Birmingham’ or from the cities distinguished public school ‘King Edward’s’, although placings were achieved by boys from as far afield as Manchester, London and Norwich. For men, the focus of the first day’s competition was ‘Tilting of the ring’. This event had become an integral part of the Wenlock Games and is described as being where “two small rings were suspended from a cross-bar, and at these the competitors rode at full gallop with pointed lances, the reward being his who could carry one of these rings away the most time out of a given number”. Perhaps unsurprisingly, it was a Much Wenlock man; T.E. Jukes who won here after hitting the rings three times and took home the ‘substantial’ sum of £20. The second day primarily featured athletic contests for men, with short and middle distance running events. The ‘Birmingham Journal’ described that the ‘sky was cloudless’ and amongst the spectators ‘there was a large attendance of ladies’. The stars of the day were M.E. Jobling of the Northumberland Cricket Club, who took the one-mile race and half-mile steeplechase, while John Duckworth of Athletic Club Haslingden, won the High Standing Leap, Hurdle race and 100-yard flat race. "For nearly twenty minutes they tugged and bent, now separating for an instant, and watching each other like cats, to close in another fruitless attempt to gain the mastery. Lansbeger was repeatedly laid on his face, but a fall was never obtained by his opponent. It was announced amid cheers that the contest was a drawn one." The third and final day of competition featured contests in athletics, cricket, gymnastics and swimming. The gymnastics was described in the Birmingham Journal as an ‘exhibition of skill and science in gymnastic exercises’ by the members of the London German Gymnastic Society, who won every event. The cricket match featured teams from King Edwards’s Grammar School and Birmingham Gymnastic Club, with the schoolboys coming out on top by 3 runs. The final activity of the Games was swimming, held at the Kent Street Swimming Baths with races across 116, 290 and 870 yards, which were all won by members of the London German Gymnastic Society. Following the successful completion of the Games, Manchester was chosen to host the third edition of the Games in 1868. Problems with the venue ensured that the 1868 Festival was moved to Wellington, Shropshire. Conflict with the Amateur Athletic Club prevented many top athletes from competing in these ‘Olympics’ and despite later attempts at revival, this spelled the beginning of the end for the NOA. The Birmingham Olympics are perhaps the most successful Games it hosted and the organisation should be remembered for its attempts to bring together a number of sports in organised competition, a pioneering event that have paved the way for the events organised by the IOC and Commonwealth Games Federation. Article prepared by Luke Harris. Connect for more of Luke's articles. Artists impression showing how the new £60 million Sandwell aquatics centre will look have been unveiled. 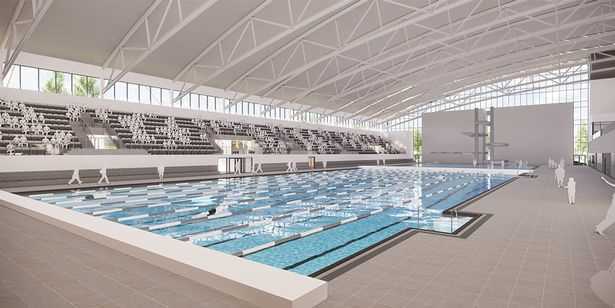 The state of the art facility with Olympic-sized swimming pool, 25-metre diving pool and capacity for 1,000 spectators will be built in Smethwick on Londonderry Lane. At the end of the Games, it will become a leisure centre. Members of the public now have a couple of weeks to comment on the plans for the swimming pool. Sustainability is a three-pronged concept. It’s economic, environmental and social. So I can see it’s always going to be difficult where you’ve got to break some new ground, but one of the new facilities would come to Sandwell, and it would be a lasting benefit for the community. But in terms of sustainability, if you look at what is happening, the augmentation of seating capacity is mostly designed because we’ve learnt from the London Olympics that you can build temporary seating to bump up the capacity of your facility, that you can then take back down so that you’re not left with a white elephant. And you won’t get a white elephant. You will get a great legacy in Sandwell." Councillor Ian Ward has said that arrangements will need to be made between Sandwell Council and Sport England over the use of green belt land but still feels that 2022 will be the ‘Greenest Games’ to date and he adds "I think for Sandwell to have what I believe will be the best aquatics centre in the country, post games, is going to be a fantastic boost for Sandwell." The proposed multi-million pound village for the Games will accommodate up to 6,800 athletes and officials. 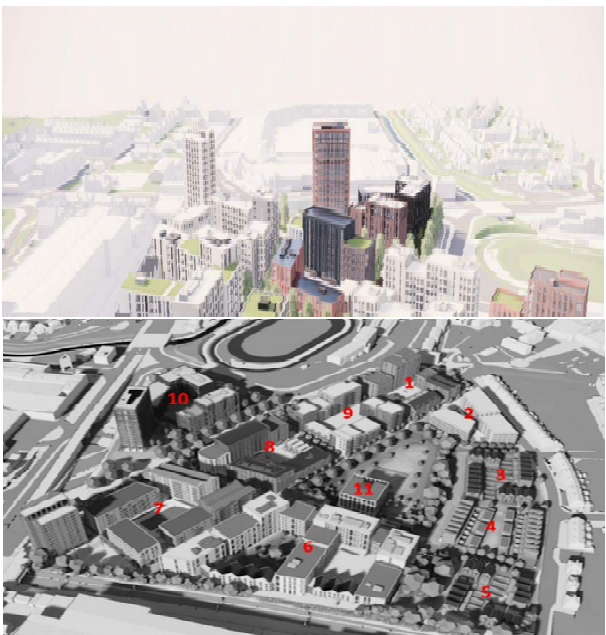 Here are the images for the plans as prepared by Birmingham City Council which are out for consultation till 13th September. Take the full post and links. 11 proposed plots making up the Athletes Village for the Commonwealth Games 2022 in Birmingham. Village to be located at Perry Barr. See 2022withYou for more on the Commonwealth Games plans and developments. To get involved as someone who is passionate about the Games and what it offers Birmingham and community, connect with us here. Great opportunities to work on one of sports greatest events! Take the full post for the jobs and the links. Connect here to Morgan Hunt job description and specification. Great opportunity for talented jobseekers who want to be a part of something very special. It's 4 years to go! Let's plan and together create huge impact! We're backing the #4YTG campaign launched by Birmingham and the Commonwealth Games team so as to generate even more awareness of the Games and the huge rewards they will bring for Birmingham. In fact we've gone further with our support for the Games and we've created a digital space for impact focused collaborations. Take the full post for more details. BirminghamWeAre.com is a digital 'shout out' space and collaborative working environment for people to promote their passion and connect with people who share the passion that is Birmingham. 2022withYou.net is a digital 'shout out' space and collaborative working environment for people to promote their passion and connect with people who share the passion that is the Commonwealth Games. FreeTimePays Communities of Passion have been launched for both Birmingham and for the Commonwealth Games. Both Communities of Passion provide a digital gateway through which passionate people can gain access to a suite of FreeTimePays engagement tools which they can use to create an impact and make that all important difference for themselves and others. Let's connect HERE and take your passion to the next level. Let's get behind this great City of Birmingham! We're providing the digital space so together we can show the world what this great city of ours has to offer. If you take photos, create art, or run a business here in the City; whether you're a musician, a poet, play sport or run community activities, get in touch with us - we're stronger together! Barry Whitehead was on hand to witness rehearsals ahead of the Commonwealth Games hand-over by Gold Coast, Australia. 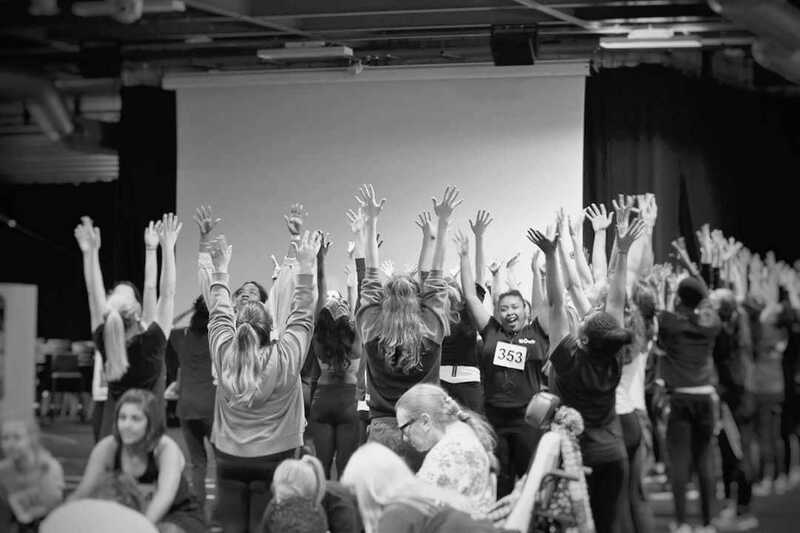 The hand-over to Birmingham takes place on the 15th April with a performance by 400 young people broadcast live. Take the full post to view a selection of photos taken by Barry. Spread the word with a social media thunderclap. Take the link below and give this campaign your personal vote of approval.